2017/09/09 Thank you for staying. During their stay they went to the nearest beach “Shirahama Ohama Beach” every day and played surfing. On the 4th day, as I didn’t have any other customers I went to Ebisujima-island in Shimoda for snorkeling with them. 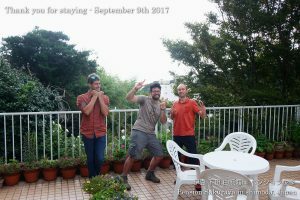 This entry was posted in Customers, Pension Sakuraya on 2017年9月9日 by izusakuraya. We had a little shower this morning and it became sunny after that. But we still had strong north wind and big waves today. This entry was posted in beach, Video on 2017年9月2日 by izusakuraya.